What is the AND Function? The AND function is categorized under Logical functionsFunctionsList of the most important Excel functions for financial analysts. This cheat sheet covers 100s of functions that are critical to know as an Excel analyst. It is used to determine if the given conditions in a test are TRUE. For example, we can use the function to test if a number in cell B1 is greater than 100 and less than 50. As a financial analystFinancial Analyst Job DescriptionSee a real Financial Analyst Job Description including all the skills, experience, and education required to be the successful candidate for the job. Perform financial forecasting, reporting, and operational metrics tracking, analyze financial data, create financial models, the function is useful in testing multiple conditions, specifically, if multiple conditions are met to make sure they all are true. Also, it helps us avoid extra nested IFS, and the AND can be combined with the OR function. Logical1 (required argument) – It is the first condition or logical value to be evaluated. Logical2 (optional requirement) – It is the second condition or logical value to be evaluated. We can set up to 255 conditions for the AND function. FALSE otherwise (i.e. if ANY of the conditions evaluate to FALSE). 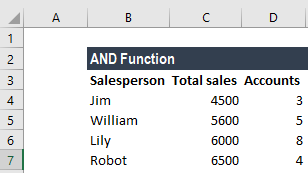 How to use the AND Function in Excel? Suppose we wish to calculate the bonus for every salesperson in our company. To be eligible for a 5% bonus, the salesperson should have achieved sales higher than $5,000 in a year. Otherwise, they should have achieved an account goal of 4 accounts or higher. To earn a bonus of 15%, they should have achieved both conditions together. Let’s see how we can use the AND function to test if a numeric value falls between two specific numbers. For this, we can use the AND function with two logical tests. 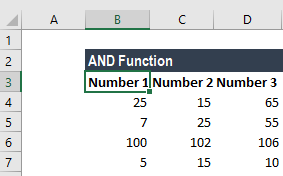 In the above formula, the value is compared to the smaller of the two numbers, determined by the MIN function. In the second expression, the value is compared to the larger of the two numbers, determined by the MAX function. The AND function will return TRUE only when the value is greater than the smaller number and less than the larger number. VALUE! error – Occurs when no logical values are found or created during the evaluation. Test values or empty cells provided as arguments are ignored by the AND function. Financial Modeling ProgramFMVA™ CertificationThe Financial Modeling & Valueation Analyst (FMVA)™ accreditation is a global standard for financial analysts that covers finance, accounting, financial modeling, valuation, budgeting, forecasting, presentations, and strategy.